Through thick and thin, through line-up changes and Rolling Stone coming out stories, one thing has remained consistent throughout Against Me! 's 20-year long career - honest, insightful, fist-pumping punk rock music. Against Me! are hitting the road tomorrow, embarking on a month and a half long tour in support of their latest album, Shape Shift With Me. I caught up with bassist Inge Johansson (pictured above, middle left) about what he's looking forward to on the tour, as well as recording the record and Against Me! 's loyal fan base. What's your favorite part about touring in Canada? I've always loved touring Canada, and I still do. Just like many other things in life, I relate Canada to music and the history of pop culture. Touring Canada always makes me think of the many great bands that came from Canada - D.O.A, Propagandhi, and Nomeansno to name a few, and that in itself makes it cool to play there knowing that I'm in a country with such an amazing history of good bands. Congrats on the success of the latest record! Shape Shift With Me was the first album you recorded on with the band, what was that experience like? Thank you! Recording at Rancho Recordo was a great experience and I think we ended up with a great sounding album. The studio is located in the countryside in Fenton, Michigan and the band lived out there for a pretty long time recording everything from start to finish, and we pretty much isolated ourselves from the outside world to focus on the music. It's rare to get that kind of full on artistic experience nowadays, to live with your music night and day, so I'm very happy we got the chance to work like that. Would you say that the band felt more pressure recording this new record compared to recording Transgender Dysphoria Blues? I wasn't there for the recording Transgender Dysphoria Blues so I can't speak for that situation. But if there's pressure during any recording that's usually from yourself, or within the band, because you really want to cut the best possible versions of the songs. You've been with Against Me since 2013 but have been playing music professionally for well over a decade. How does playing in Against Me differ from playing in other bands? Most other of the bands I previously played in were bands that I was involved with from scratch, but when I joined Against Me! they had already been going for 15 years so they already had a strong identity and a recognizable sound. So me joining the band meant adapting to their sound and way of playing, and also trying to put a little bit of me in there as well. But of course, it was a very cool feeling going from being a fan of the band to being a full-time member. 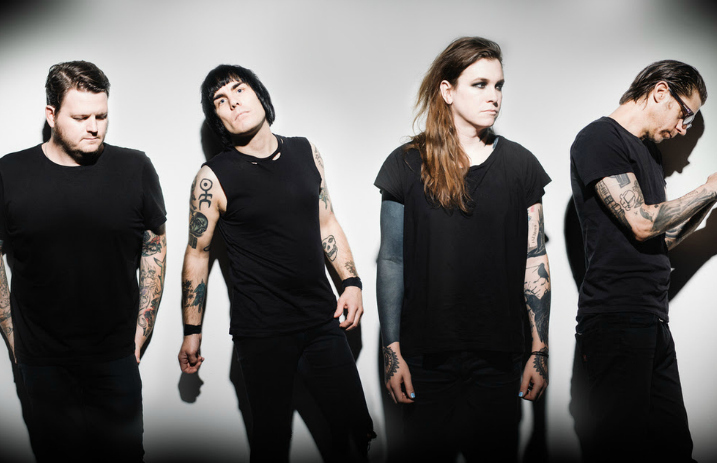 Against Me are a band that many LGBTQ+ people seek out because of Laura, as well as the music subject matter in general. How do you make your shows a safe and welcome space for people? Yes, and I'm very honored to see that happening. It's a great thing to be a part of. One thing that we do sometimes is to invite local LGBTQ+ organizations to our shows and have them inform people about their local activities. If you look at history there's always been a link between social movements for change and pop culture. The counter culture era of the 60’s and its direct connection with rock and psychedelic music is just one, but a great example of that. So if we as a band, and our audience, are now carrying that torch, then we're in a very good place. Would you say that there's a tighter knit community amongst Against Me fans? Even before I joined I had the impression that Against Me! was a very polarizing band within the punk community. People didn't seem to be “casual fans” that much even back then - it felt as if the band and the fans were very close. And that's also the feeling I get now when I see fans traveling long distances to see a bunch of shows on the same tours, hanging out with other fans from other places that did the same. That's very cool to see! What are your thoughts on how the punk music scene has changed over the years? It seems like we've recently discovered the fourth chord. What's next for Against Me? More music and more subversive activities. Stay tuned! Shape Shift With Me is available now through Total Treble Music. Be sure to catch Against Me! this month on tour when they stop in Winnipeg (September 2), Saskatoon (September 3), Edmonton (September 5), Calgary (September 6), and Vancouver (September 8) - click here to buy tickets!